Finally. After so much talking about Althea, this is it when I decided to pen my first unboxing. New to Althea? You sure don't wanna miss this! My first impression on the products I get. If you follow my Instagram (@skhelyt), perhaps you already saw these spoilers 2 weeks ago. 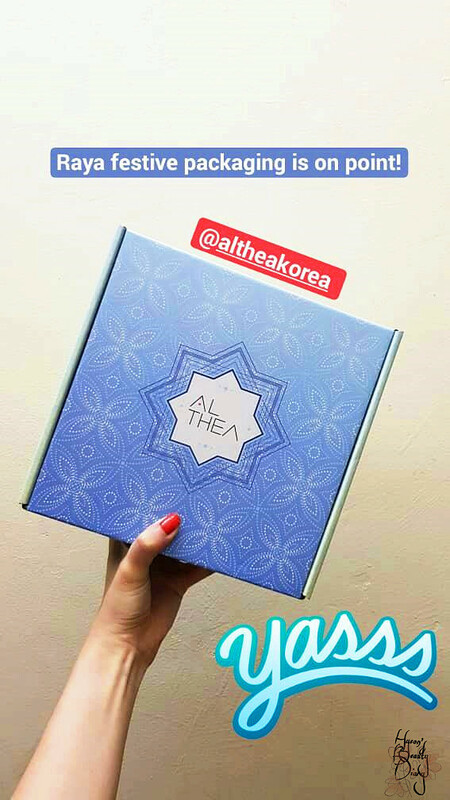 That's the day when I received the parcel and I was so excited to share with you all. 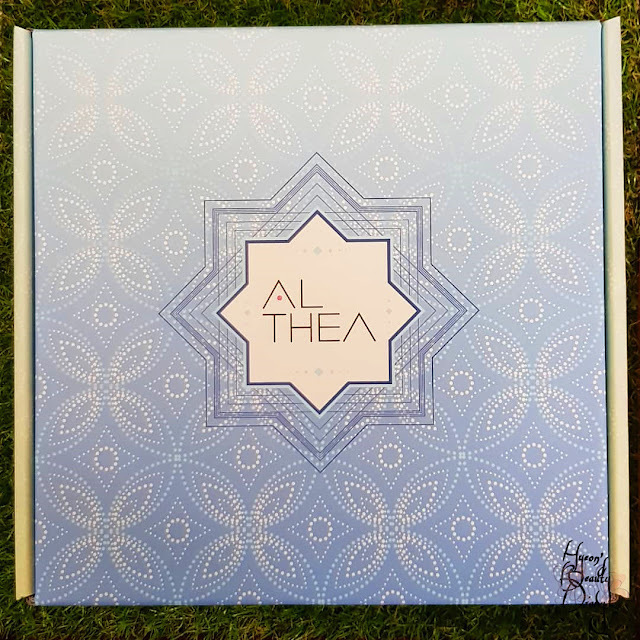 Just if you're new to Althea, they are famous for lovely and dotting sturdy packaging, especially when they change the box design according to festive season. You just outta check them out during Christmas, New Year, Anniversary... Just to name a few. 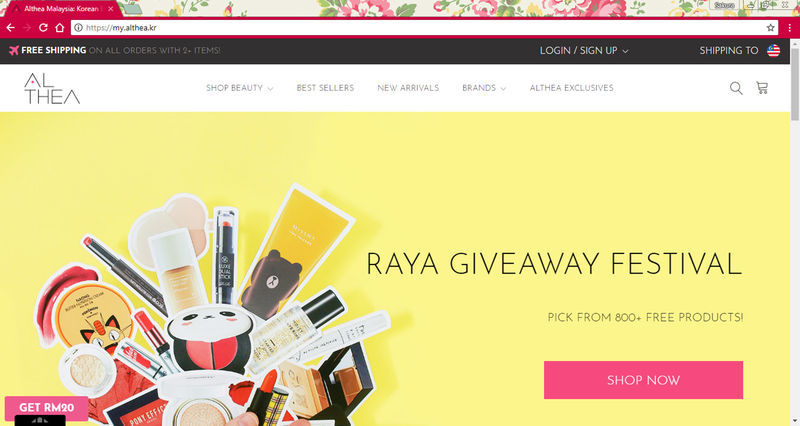 Of course, here we got Raya Edition! Isn't it eye-catching? You can either store stuffs in it, or even for collection/display. I believe most of us are familiar with this product. 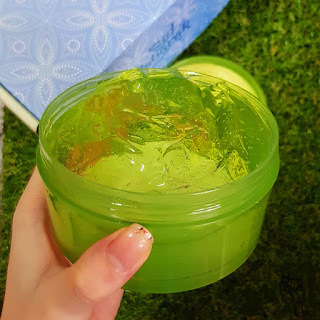 Yes, this is THE Aloe Vera Soothing Gel that the whole world went crazy about it. 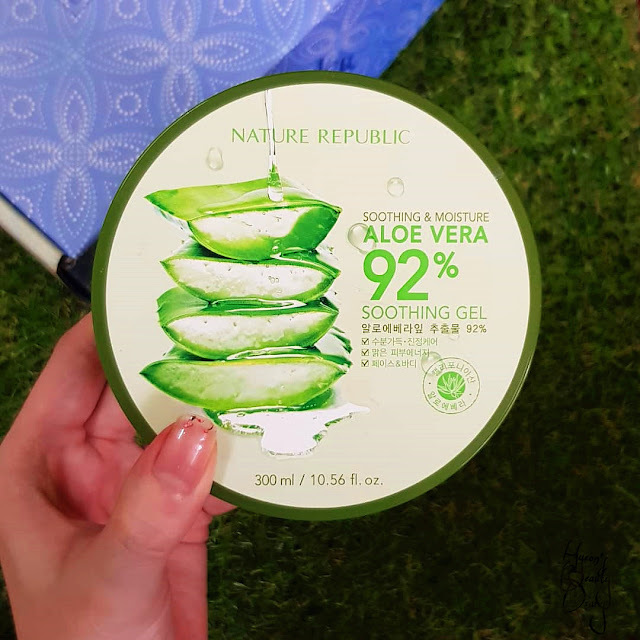 There are many similar products which were introduced to the market after it launched, but after all, this is the original Aloe Vera Soothing Gel, and it is from Nature Republic. 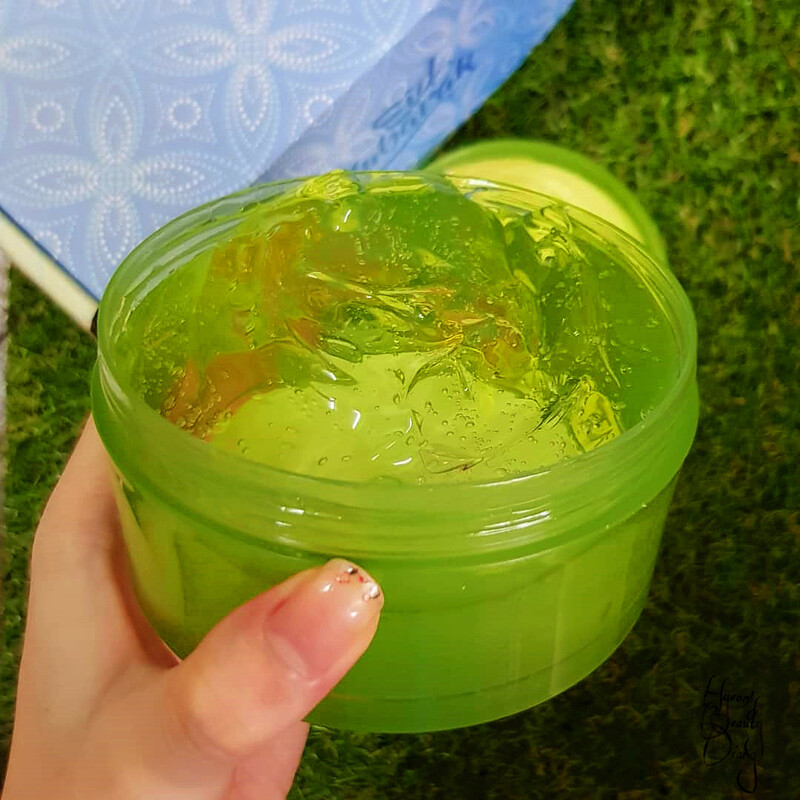 If I remember correctly, this is the 4th Aloe Vera 92% Soothing Gel that I have bought so far. And for the record, three (including this one) were bought for my dad. He really enjoys using it. It is the only item among all that I've tried before. However, it was too long that I have forgotten how it feels on the skin. So I grabbed a bit and tried today. Indeed it has this amazing cooling effect once you applied on the skin. And when it sinks in, you can feel the moisture beneath. 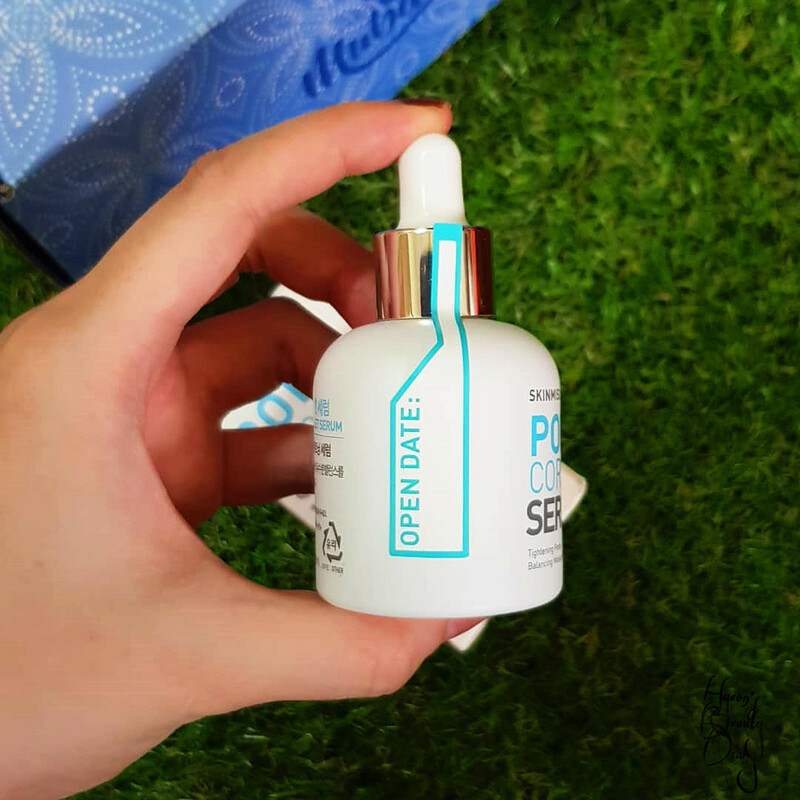 I have read so much good reviews on this damaged hair protein ampoule. From what I observed, this product often goes out-of-stock on Althea. I took some of the product today and tested on the end of my hair. The result is quite promising. I will continue observe and bring you my final verdict some time later. I have been looking forward to this product for some time now. 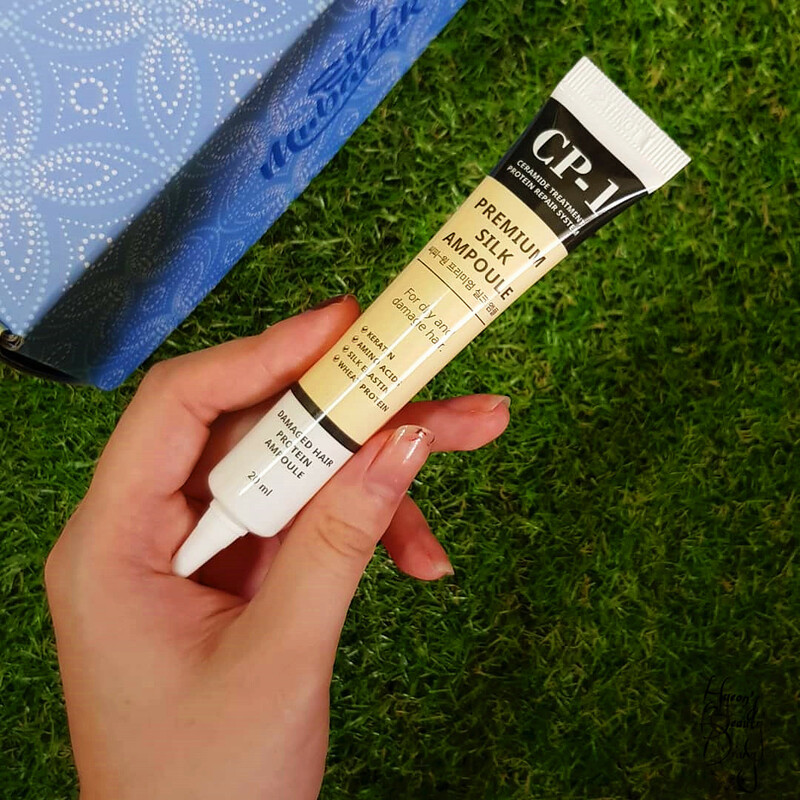 Also, I read and watched many good reviews on how this product helps to tighten up sagged pores. Currently I am quite concern with the enlarged pores around my nose area. Probably because I didn't take much care after extraction. I haven't open this product yet as I supposed I have to time my usage once opened the bottle. 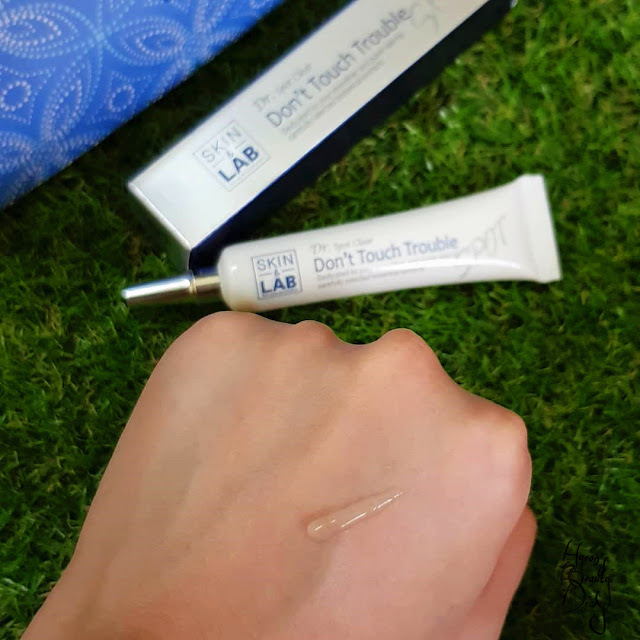 At the moment, I am in the midst of trying out another product with much active ingredients, and I don't wish to interrupt the process. So I might as well keep it in my stash. This product sits in my wishlist for quite some time now. For the past records, I haven't try other hydro eye patches other than PETITFEE, in which personally I enjoy using the Gold version. As I am about 6~8 patches left to finish my current hydro eye patches, I am going to try out this sweet lovely pink rose soon. Rose scent is well-spotted. And look at that lovely pink shade. Just can't wait to try them on. This product here is rather new to me. 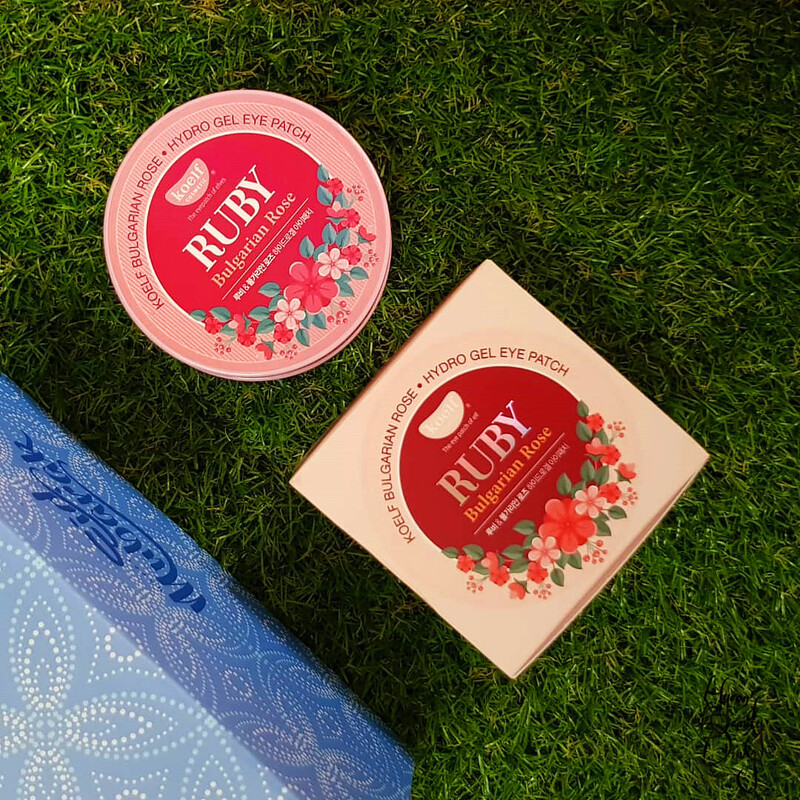 I was attracted by its saying which it carefully uses selected botanical extracts to soothes trouble areas. YASSS I need that urgently!!! 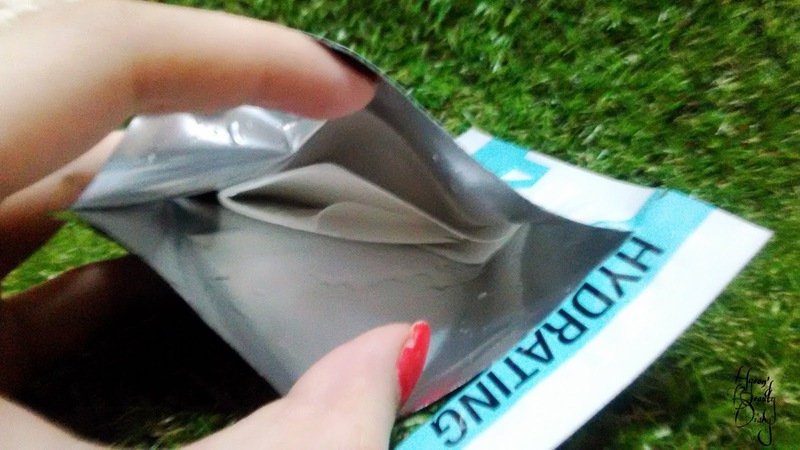 I applied it on my trouble areas immediately on the day I got the parcel. 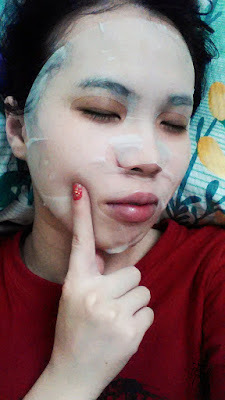 It has this cooling sensation which helps to soothes my newly popped pimple areas. At least it helps me to not touch those trouble areas and let them heal. 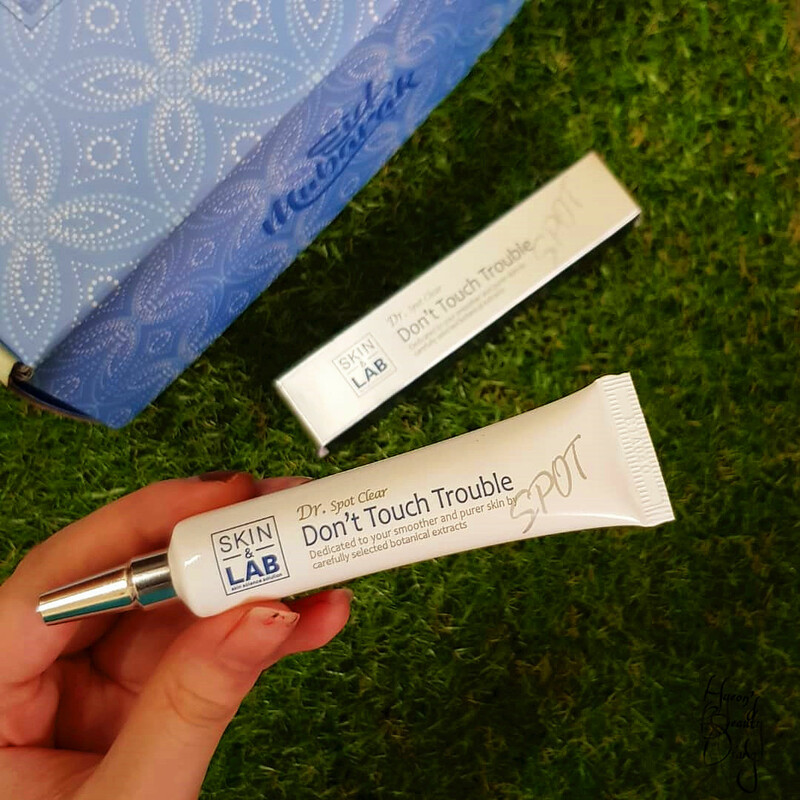 IT'S SKIN's Power 10 Formula series is like their signature series. One thing for sure, they are super budget-friendly. 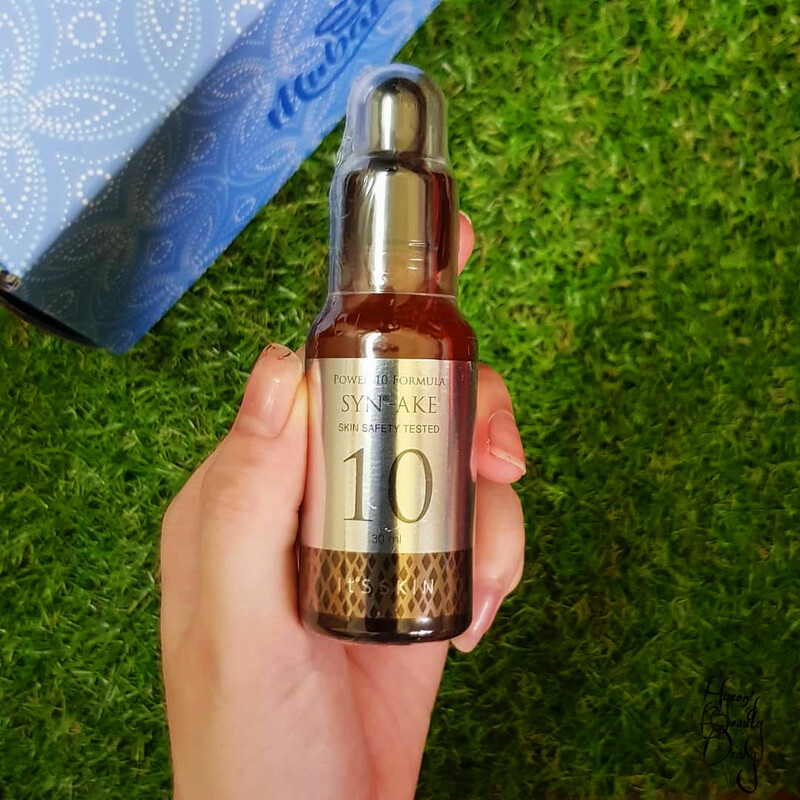 Particularly, this SYN-AKE serum is known for anti-wrinkle and rejuvenating. In fact, this is also a gift for my dad. I think it would be a good start for him to start his PM skincare routine. 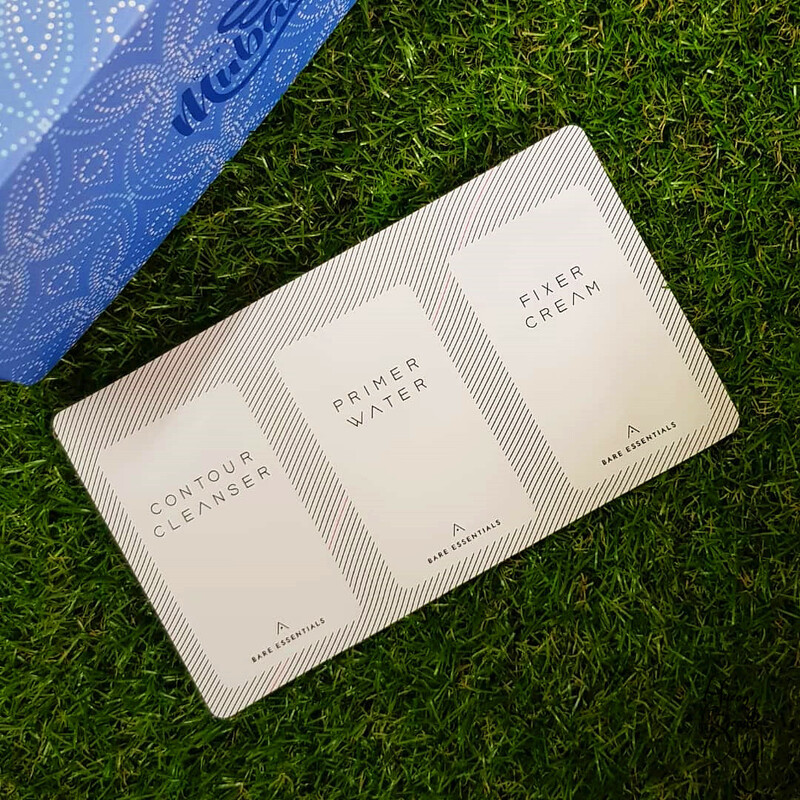 Ever since Althea launched it's very own brand Bare Essentials, I have been wanting to check them out. As I was still indecisive on whether to purchase or not, here we have - the samples. That's super awesome! Now I could try on first before deciding to purchase the full size products. And here you go - my first unboxing. Can't catch up with the matte nail trend?? 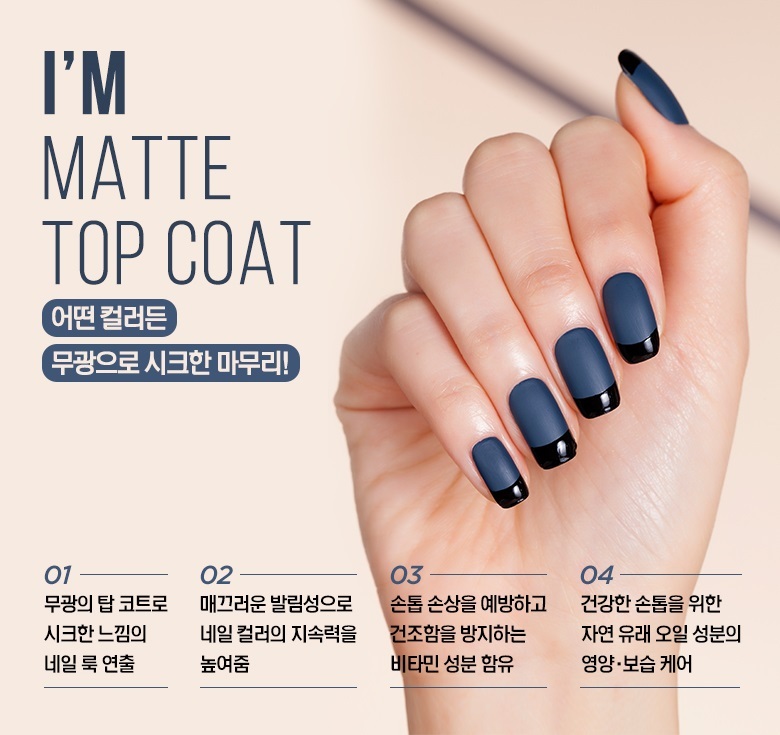 Try I'M MEME I'M Top Coat in the code #TC002 Matte Finish. This is a magical ingredient to make all your nail collection into matte finish! Its product description is rather straightforward. I’M MEME Matte Top Coat, unlike other ordinary top coat, it can literally turn your regular nail polish to a complete matte-finish, providing a leather-like look and texture! Classy hmm. 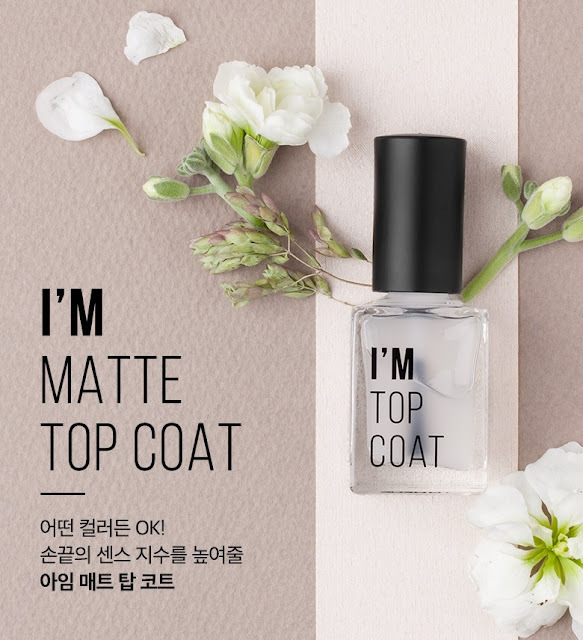 Formulated with Vitamins A, B, C, Vitamin E and Jojoba Oil, this matte top coat is able to protect and keep your nails healthy and strong. With advanced technology, this matte top coat actually dries fast with a vivid color expression. Besides, it is especially formulated to be less prone to nail chipping and long lasting than regular top coats. To use, simply apply evenly over your nail polish and let dry for about 5 - 10 minutes. 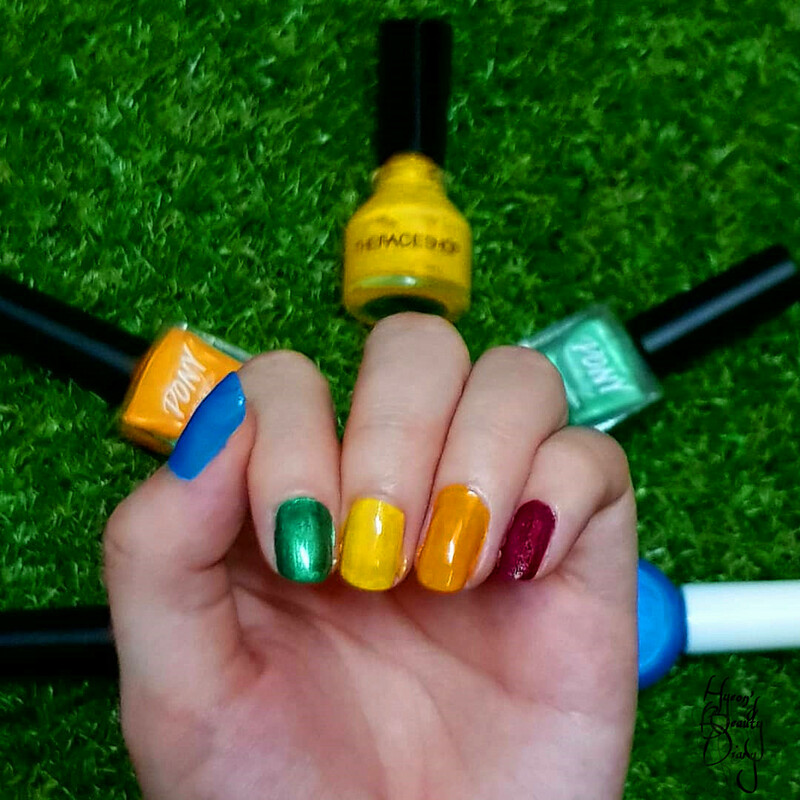 Here I'm using a variety of colors from different brands: maroon/red + orange + green from MEMEBOX PONY Collection; yellow from The Face Shop; blue from Holika Holika. 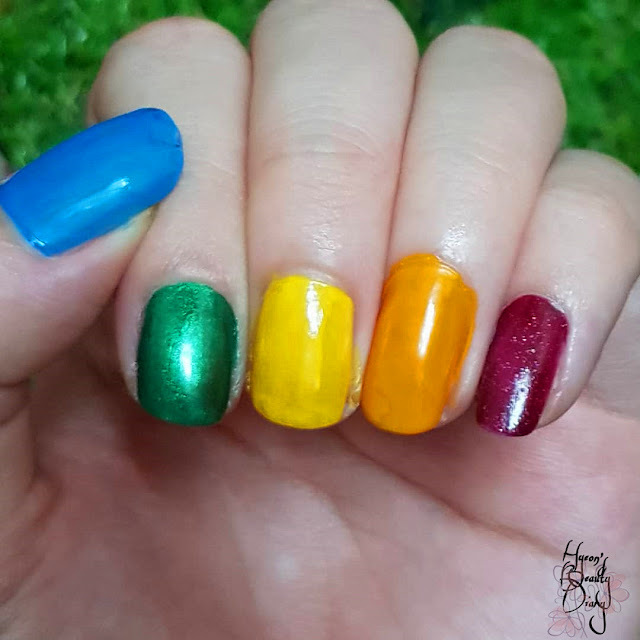 I noticed the Matte Top Coat works better for plain color, without glitter base; for instance, blue, yellow and orange. Nevertheless, it does toned down the shiny effect for both green and red (although the camera couldn't capture it). 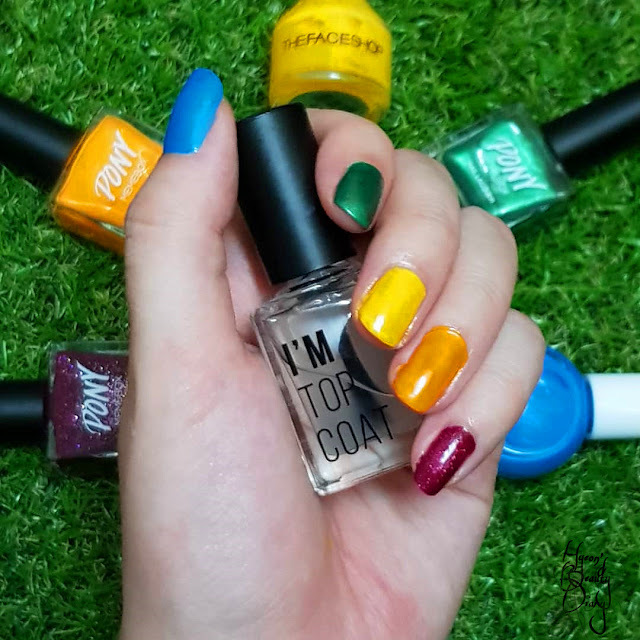 I am still amazed with this "matte top coat" idea until now, as I am writing this post. What a brilliant idea! 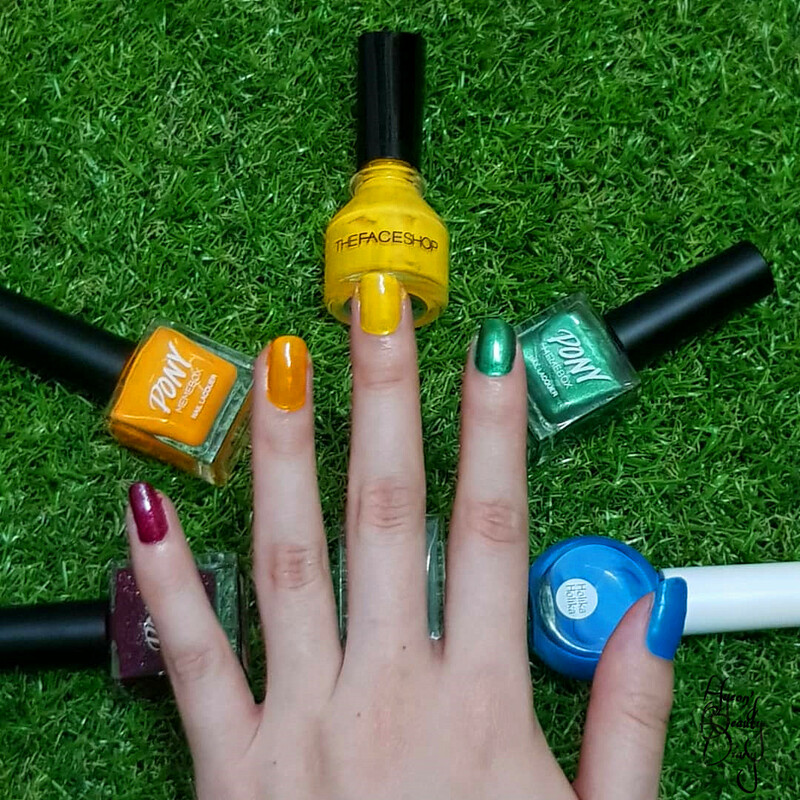 Now everybody can achieved that chic matte manicure everywhere and anytime! Plus, this product is retail at a very affordable price. Recommend: It does what it claims and worth the price. 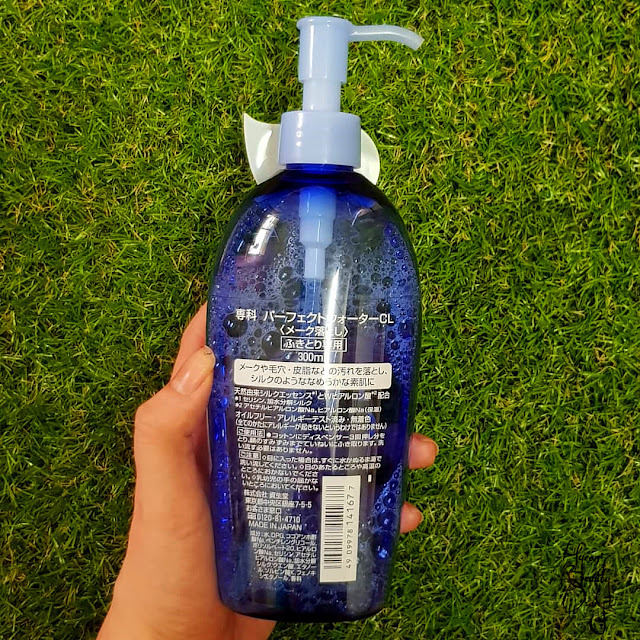 Repurchase: Not so soon since one bottle can goes a long way. 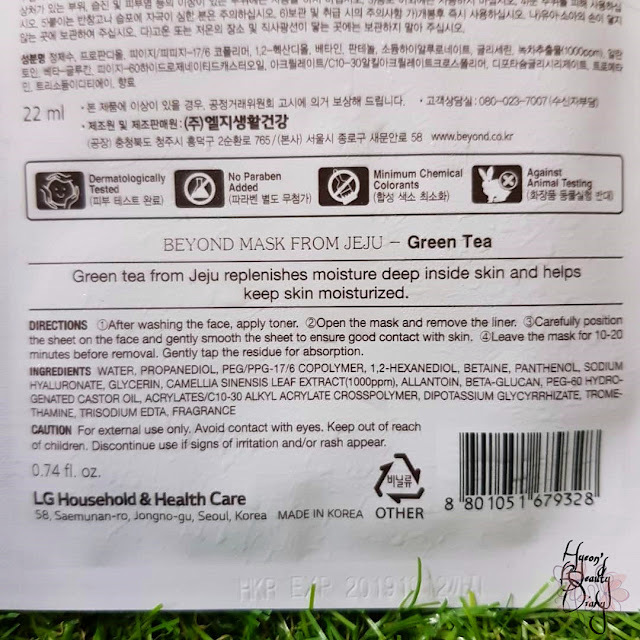 It's another Beyond sheet mask review. 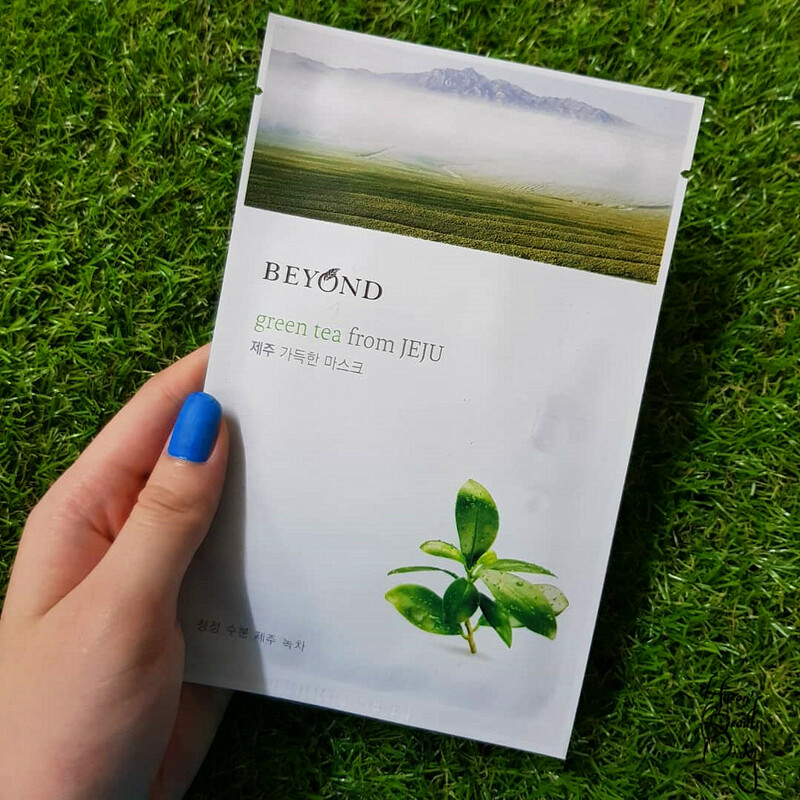 Beyond's Green Tea from JEJU | 비욘드 제주 가득한 마스크 그린티 | 0.74 fl, oz. It was 4 months ago when I first shared my experience with Beyond sheet mask. 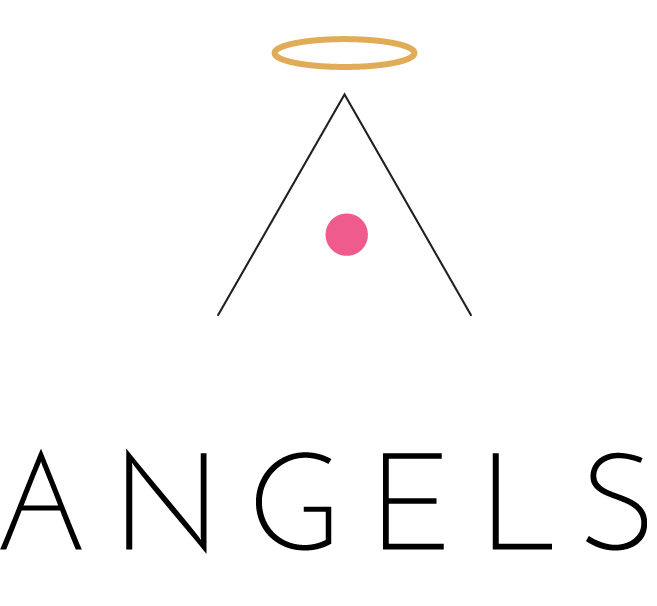 The brand is well-known for its eco-friendliness. Not only because of natural ingredients, but also publicly against animal-testing. There is this cycle that I noticed on my skin.. I call it "the stress cycle". 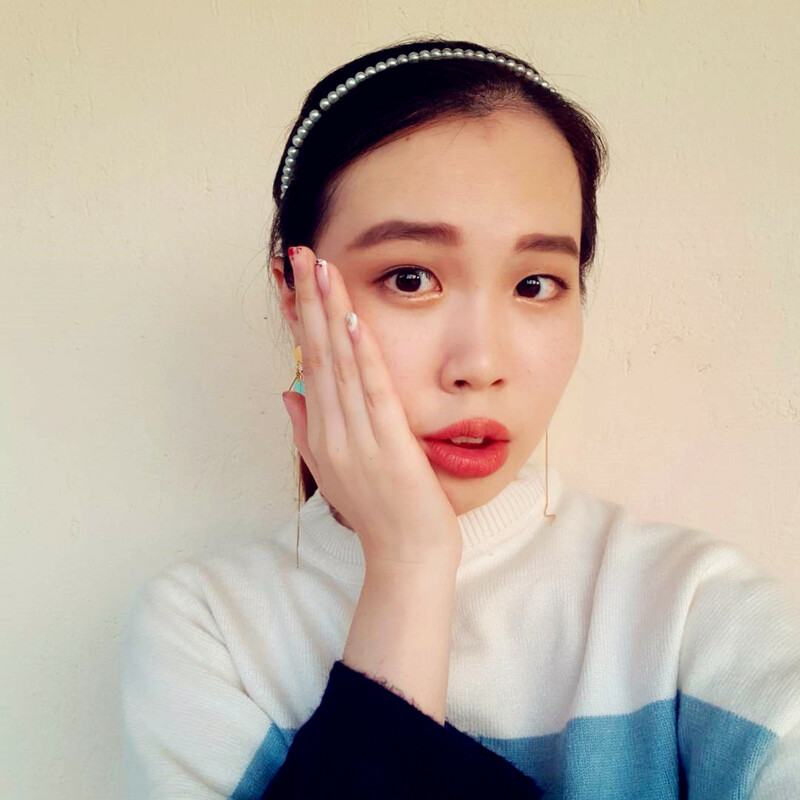 During the 30-day cycle, my skin gets from stable to problematic then stable. And here's when my skin gets me nut and I needed something to cool that heat down. 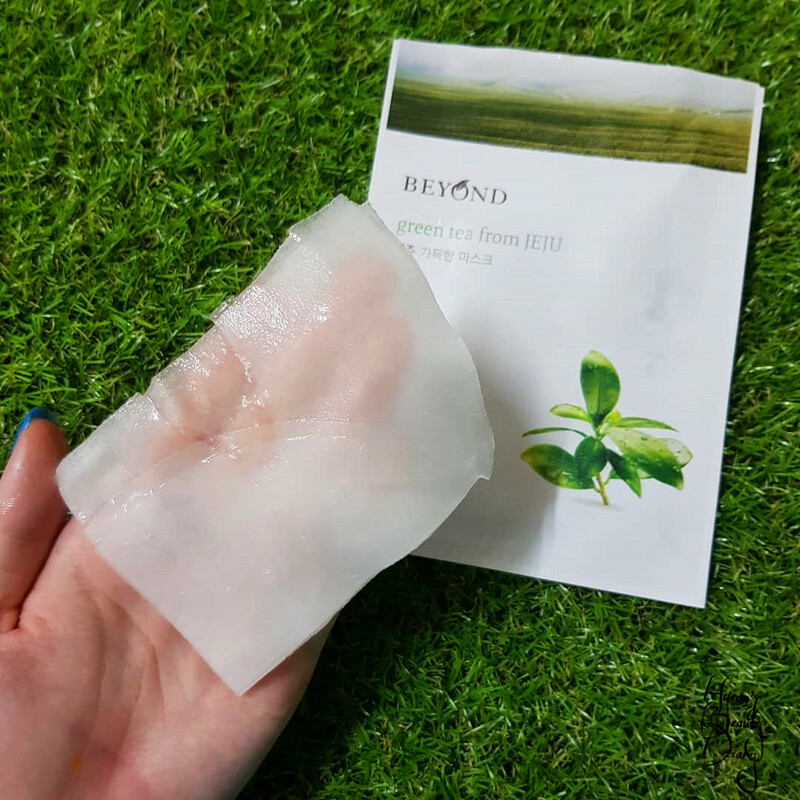 "Green tea from Jeju replenishes moisture deep inside skin and helps keep skin moistured." -Beyond. "Dermatologically tested. 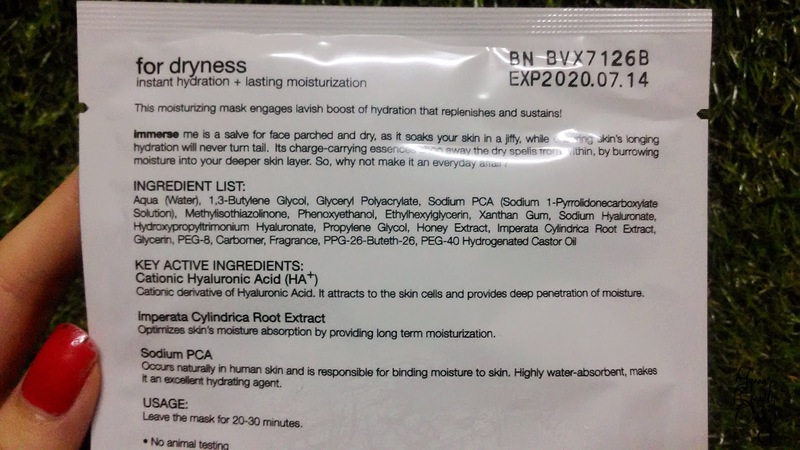 No paraben added. 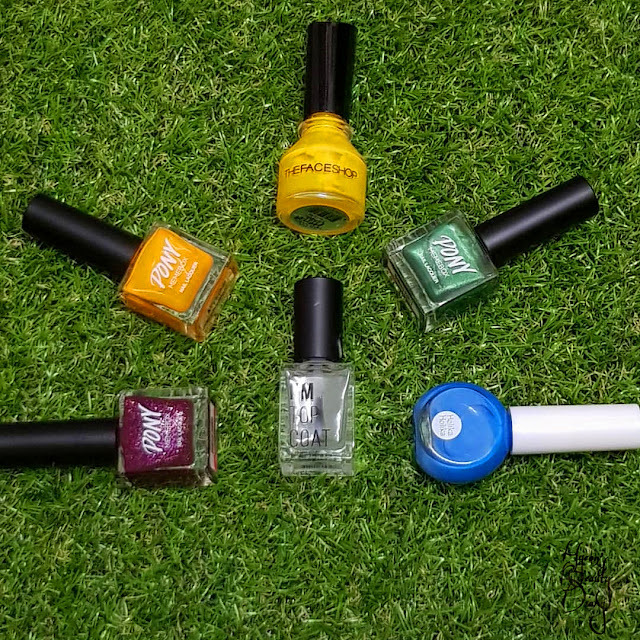 Minimum chemical colorants. Against animal testing." -Beyond. 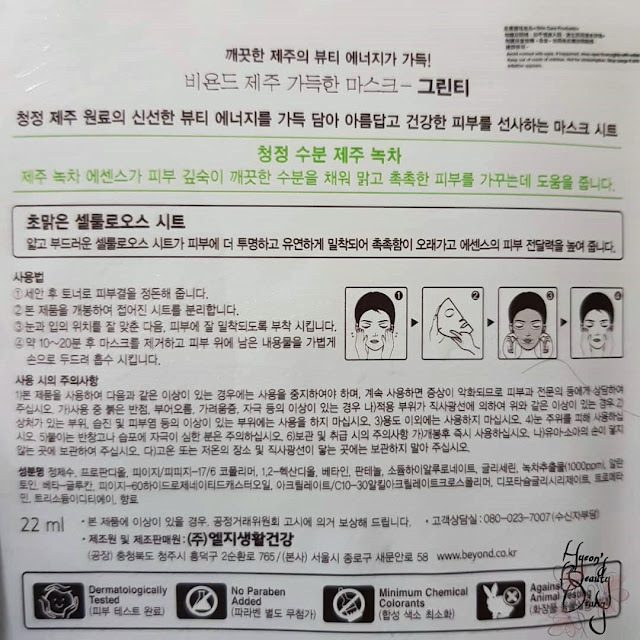 Water, Propanediol, PEG/PPG-17/6 Copolymer, 1,2-Hexanediol, Betaine, Panthenol, Sodium Hyaluronate, Glycerin, Camella Sinensis Leaf Extract (1000ppm), Allantoin, Beta-Glucan, PEG-60 Hydrogenated Castor Oil, Acrylates/C10-30 Alkyl Acrylate Crosspolymer, Dipotassium Glycyrrhizate, Thromethamine, Trisodium Edta, Fragrance. The packaging design is simple yet conveys message. The green endless field... what a view! Once I opened the package, a pungent green tea scent rushes into my nose. That's quite a statement... And I actually enjoys it (surprisingly!). It's super relaxing and healing. 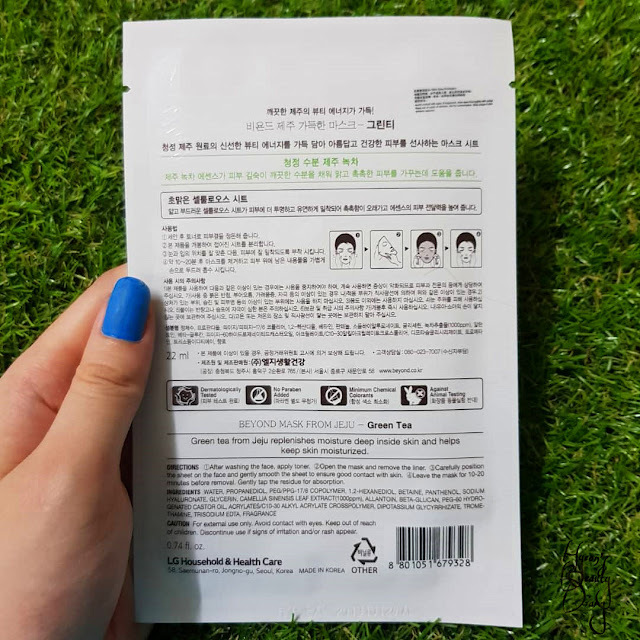 The sheet mask itself is thin. It felt more like fibre rather than cotton. Hence it is not that stretchy. Still comfortable to wear on the skin. I left it for more than 30 minutes. By then, both sheet mask is still moist and I can feel my skin has a water protection layer on top of it. Lightly pad for faster absorption. Overall, I enjoy its formula/green tea essence and the aromatic scent. 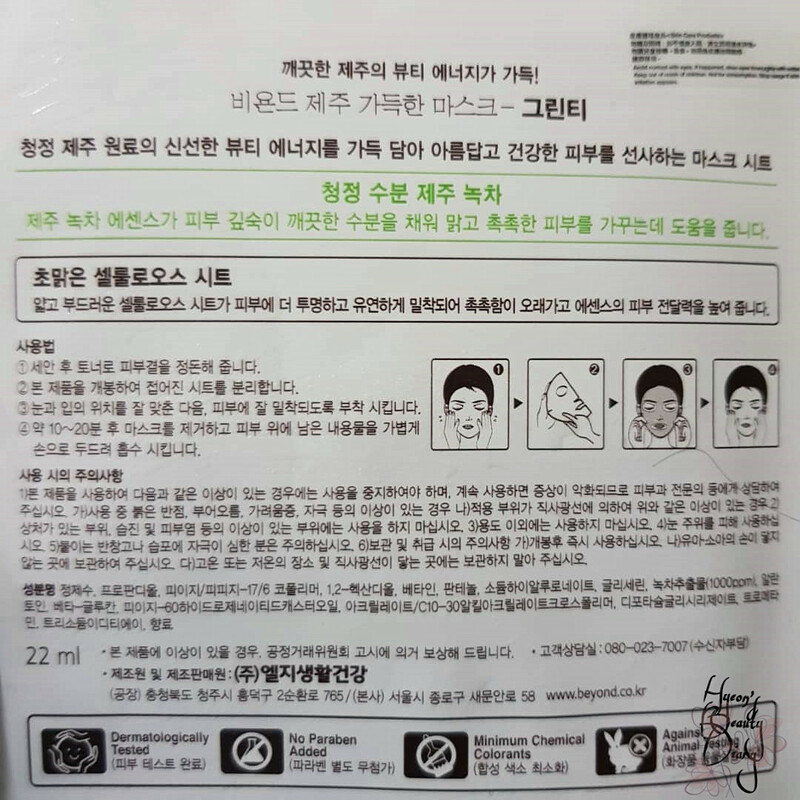 However, what pulls down the score will be the texture of sheet mask. I rather prefer stretchy and breathable texture. I bought it from my last trip to Hong Kong. Can't remember how much I bought it for. 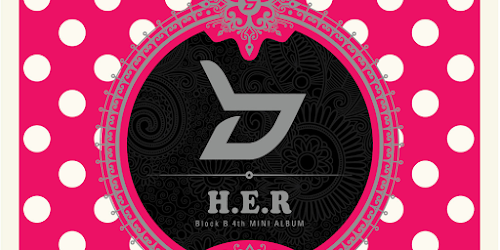 This product is available on YESSTYLE (not affiliated link). Recommend: Only if you enjoy green tea scent. 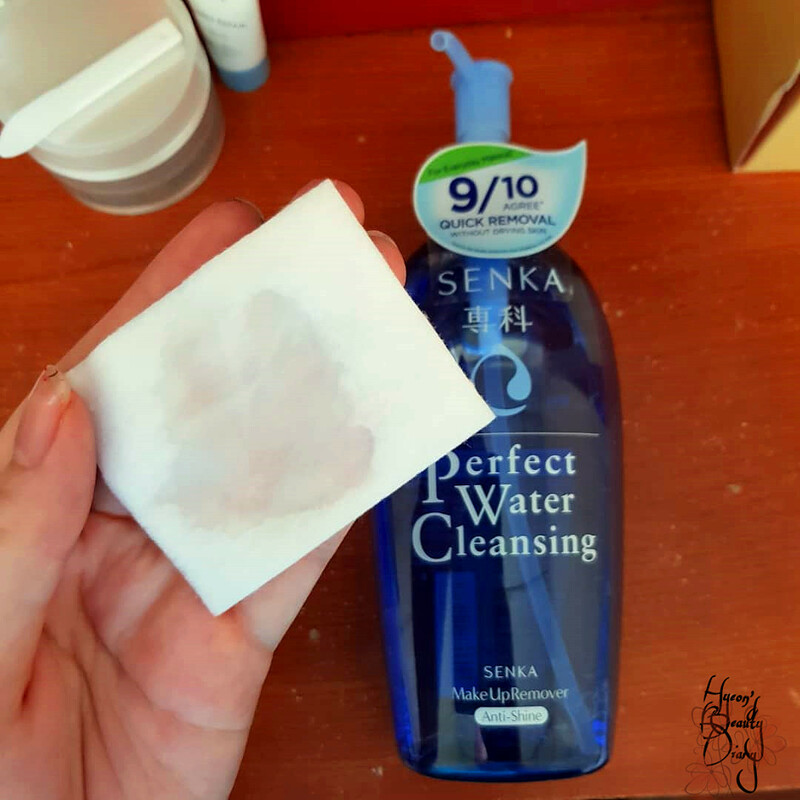 To my very surprise, my earlier review post on Senka's Perfect Whip Cleansing Foam has been topping the Top 5 Trending Posts in my blog. Perhaps more and more people are trying to know better of this brand and its products. 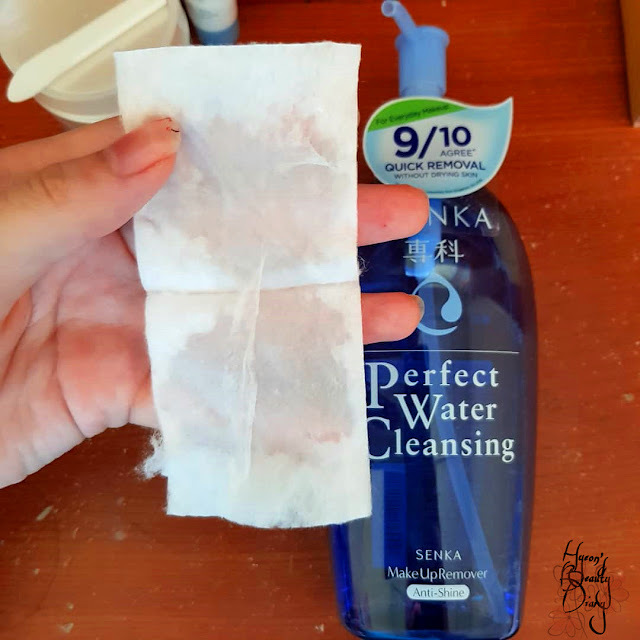 Hence today I will be sharing with you my current cleansing water by Senka - the Perfect Water Cleansing Make Up Remover. One of the obvious trait that Japanese products are living is minimalist design without compensating the quality of the product - which I adore. 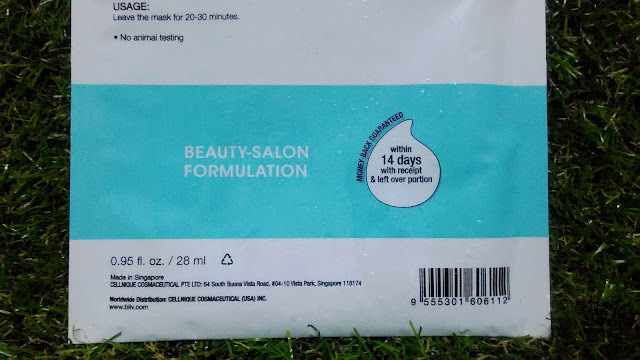 The packaging is in calming blue plastic with a pump-head. Big volume (of 300ml) good for months. 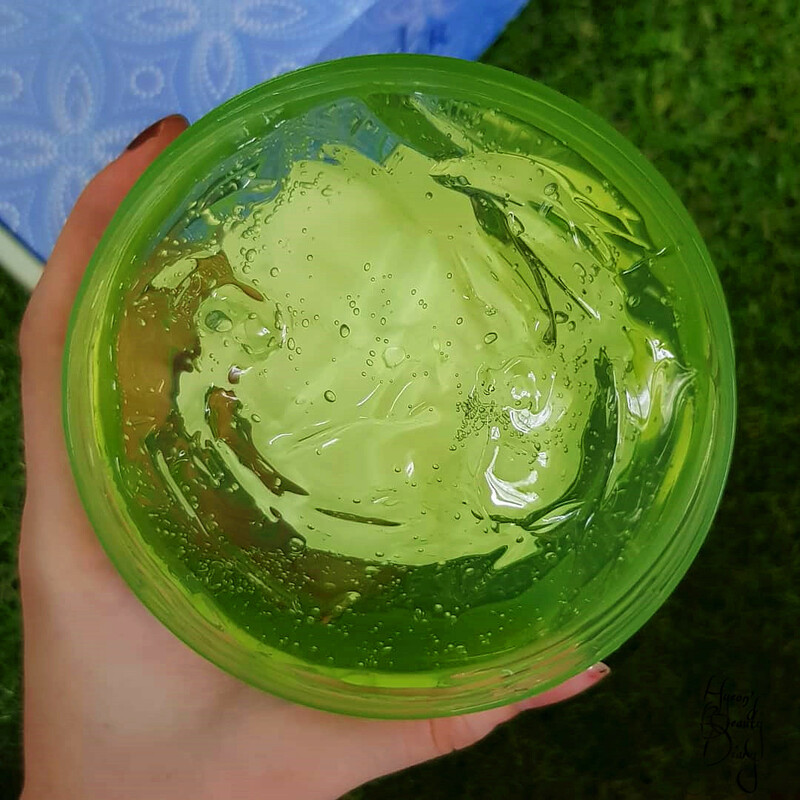 It has the viscosity similar to water with additional moisture-touch to it, so it won't leave your skin dry after removing makeup. 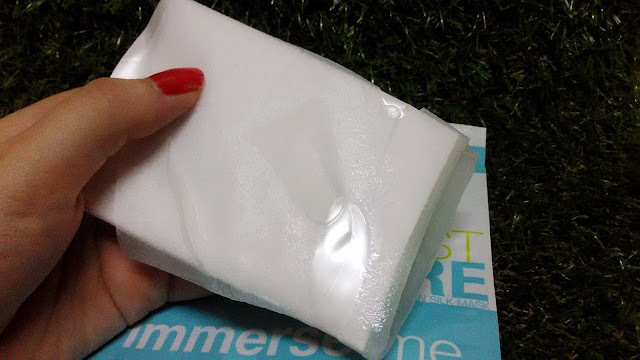 "9/10 agree quick removal without drying skin." -Senka. 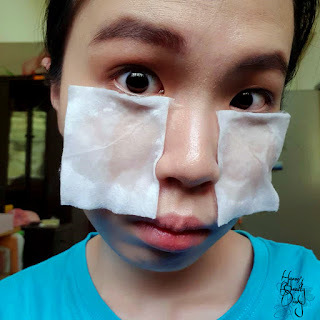 To use, for me I usually do 2-3 small pumps on a cotton pad (as below). It does has this soap fragrance to it. 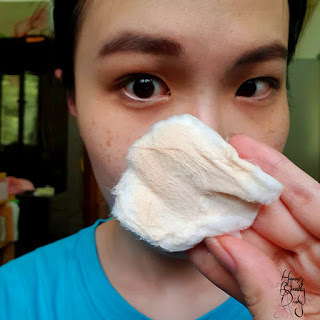 Be careful with the amount cause if it's too much on the one cotton pad, it will create a soap-like layer on top of the skin - texture similar to like applying face cleanser on your skin. 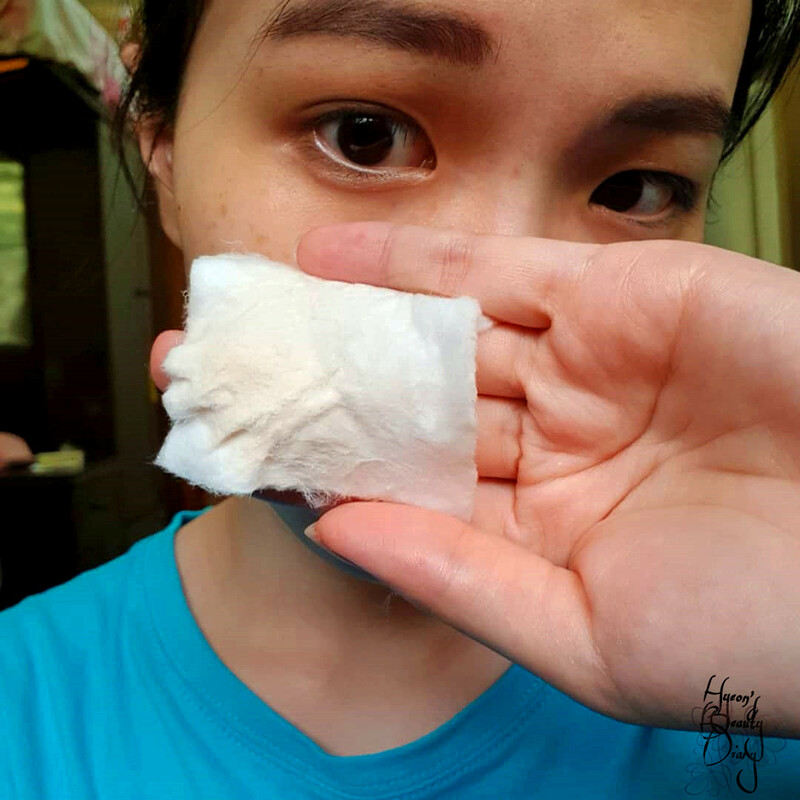 To be more cost effective (as I am always), I will tear the dampen cotton pad into half (as below) for both sides of the face. The cottons pad I'm using here are from Watson. Then proceed to wipe to remove makeup accordingly. 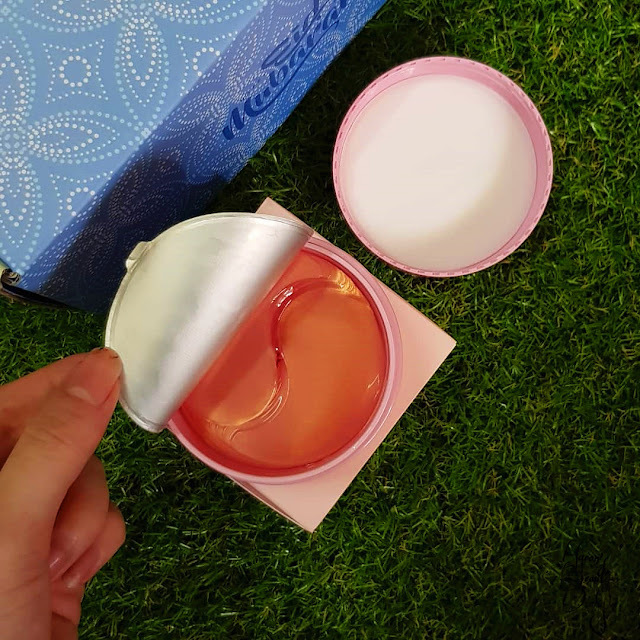 It is really mild on the skin and leaving the skin smooth. Below are the makeup removing result from my first to third cotton pad in order to remove whole face makeup (below). In fact, I only applied a layer of foundation this morning. In terms of the makeup removing power, it is definitely suitable for everyday makeup which you wear powder-type or less products on the skin. 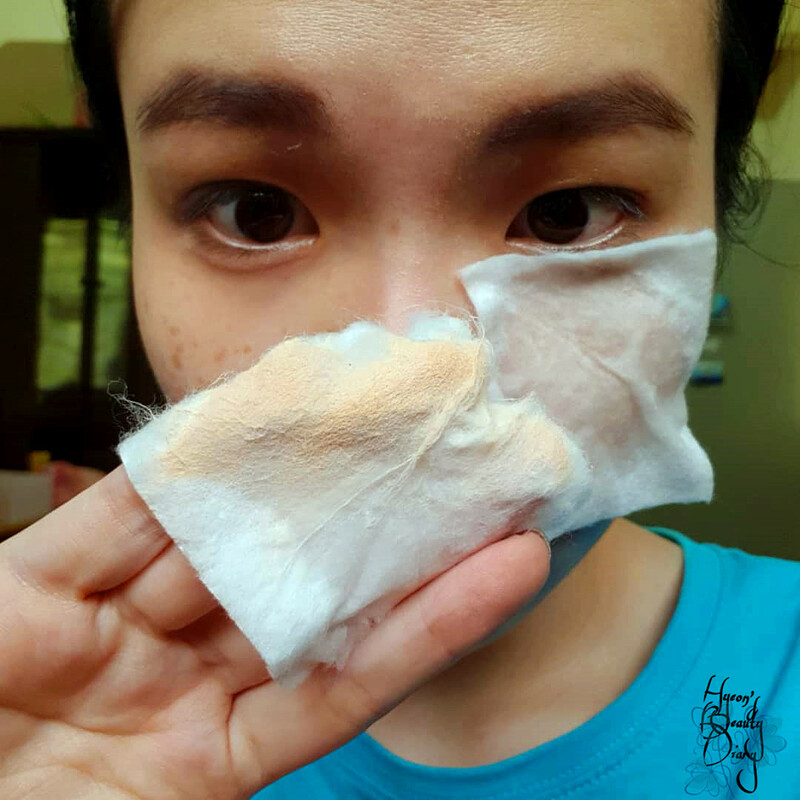 However, if you are using foundation or BB cream, you might consider doing double cleansing. 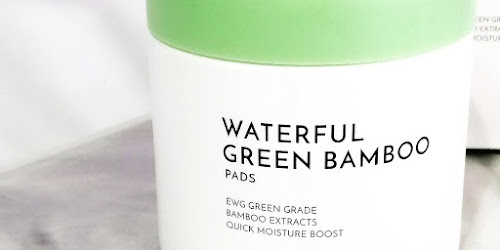 I do enjoy this product as it doesn't sting nor drying the skin during the process. It leaves the skin moist until a point which it is a bit sticky on the surface. Usually I will just rinse it with water or double cleanse it with cleansing gel. 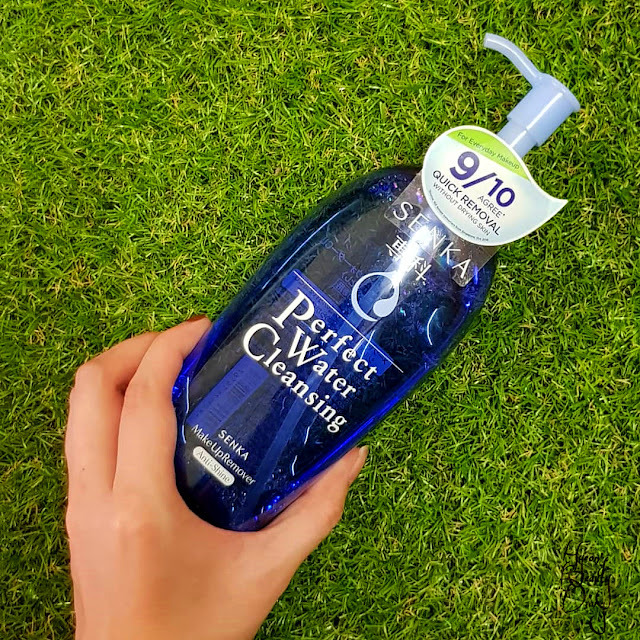 Recommend: For daily makeup remover. Repurchase: Unlikely in near future. 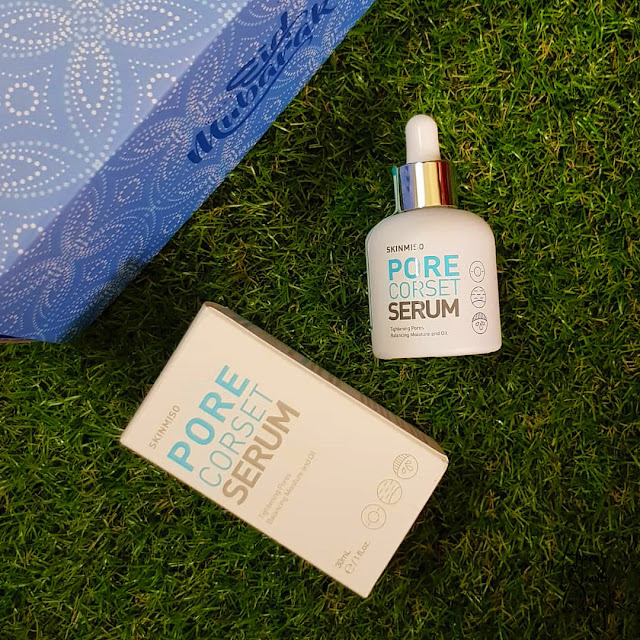 As the weather is fluctuating up and down these days, our skin losses moisture and easily get sensitive throughout the season. 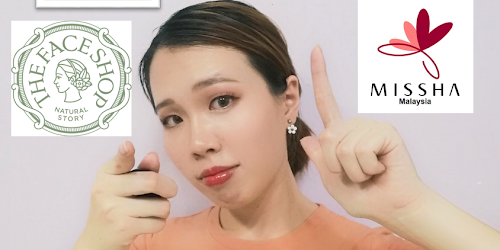 Especially as I am incorporating new skincare to my night routine which contains skin peeling agent lately, my skin tends to get flaky as they are shedding the dead skin cells. Moisturizing become utmost important step in my AM + PM routine nowadays. 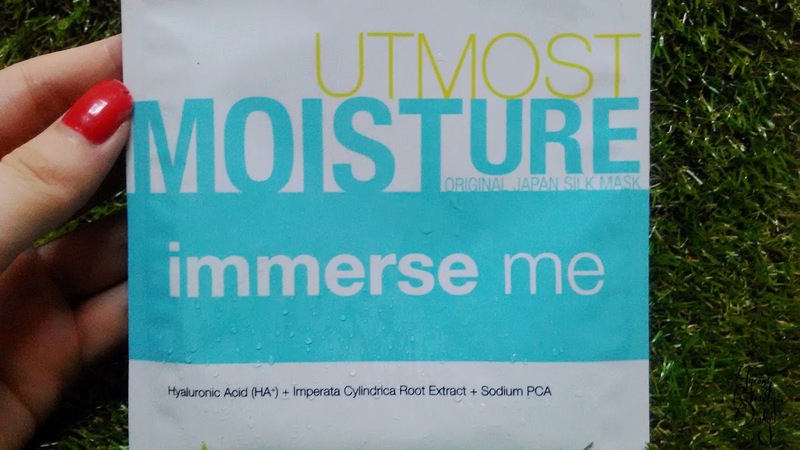 It's like shouting to me when I look at the product name "IMMERSE ME UTMOST MOISTURE". So I grabbed it and tried. 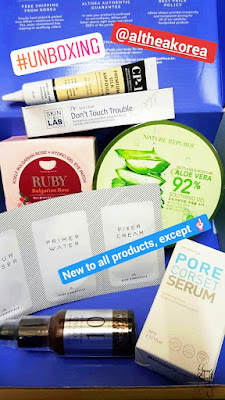 Little did I know (and now I knew) that b.liv is a cosmeceutical brand that made in Singapore and based in Malaysia! Sodium PCA - to bind moisture to skin. Aqua (Water), 1,3-Butylene Glycol, Glyceryl Polyacrylate, Sodium PCA (Sodium 1-Pyrrolidonecarboxylate Solution), Methylisothiazolinone, Phenoxyethanol, Ethylhexylglycerin, Xanthan Gum, Sodium Hyaluronate, Hydroxypropyltrimonium Hyaluronate, Propylene Glycol, Honey Extract, Imperata Cylindrica Root Extract, Glycerin, PEG-8, Carbomer, Fragrance, PPG-26-Buteth-26, PEG-40 Hydrogenated Castor Oil. In fact, this is not my first product from B.liv. However, still I am astonished to read such bold statement from the brand saying "money-back guaranteed; within 14 days with receipt & left over portion." I never see anything like that before. Let's open it up and see. There is definitely fragrance to be found. Quite artificial actually and I am not fond of that. Anyway. Clearly I wasn't reading carefully on the product description. 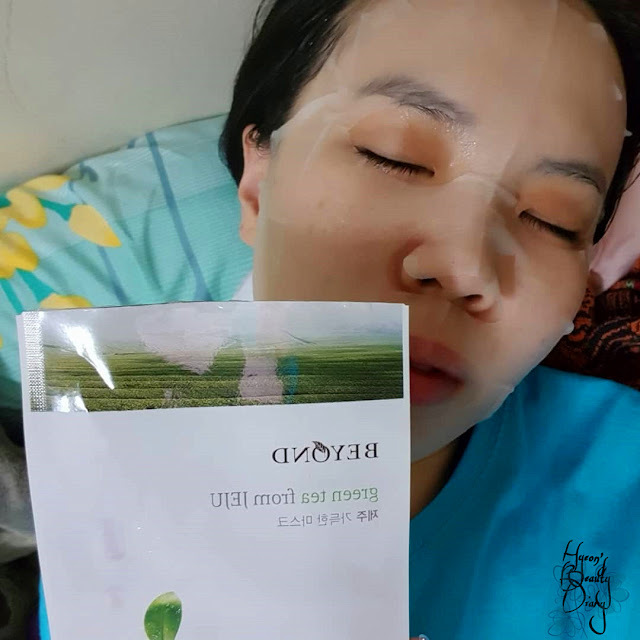 So I was caught in surprise to find the sheet mask itself is so thin and soft. In fact, it was already stated there saying they are using "Japan Silk". There is a film divider to make it easier while unfolding the sheet mask. I just love how it clings onto my face line. 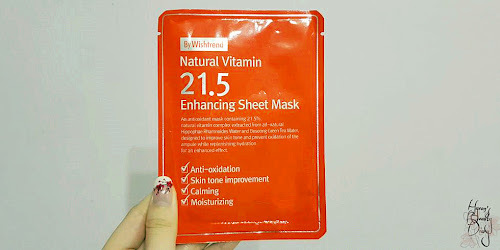 The sheet mask texture itself is stretchable. It stays in position even if you are overlapping them. The essence itself is transparent and has runny viscosity. There are so much leftover where I applied it on my hands and legs! 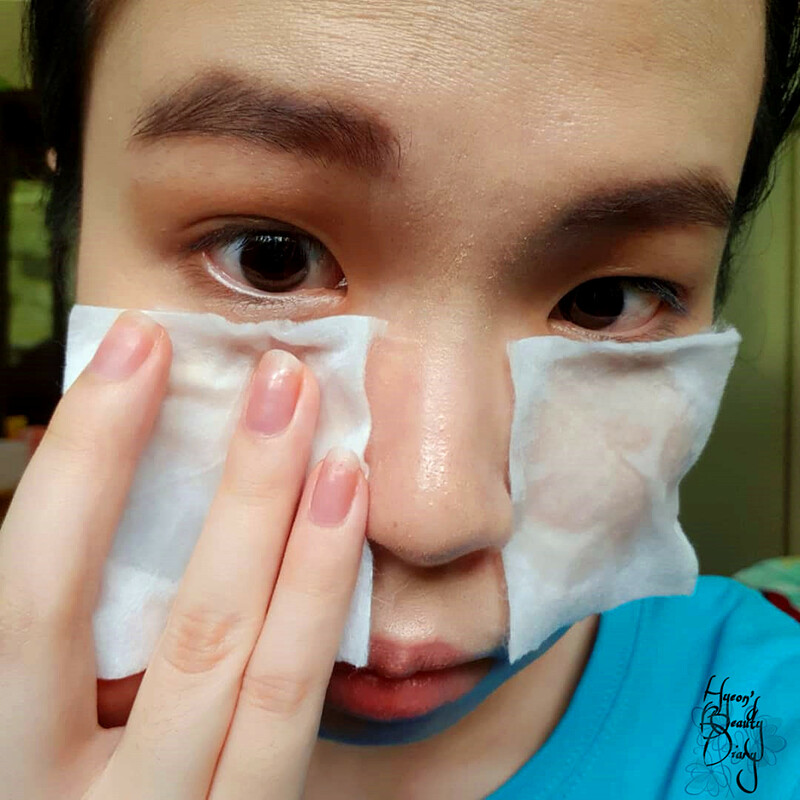 Leave the sheet mask for around 20-30 minutes. 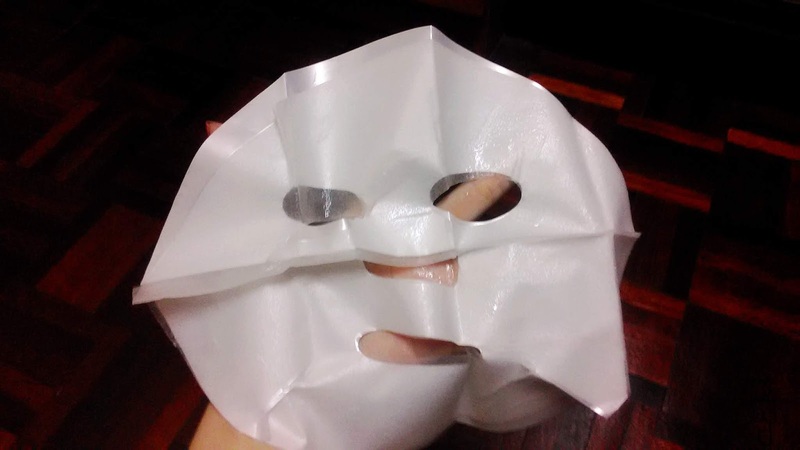 Even right before I remove the sheet mask, it is still wet. Right after applying the mask, I didn't go with any other moisturizing product before bed. 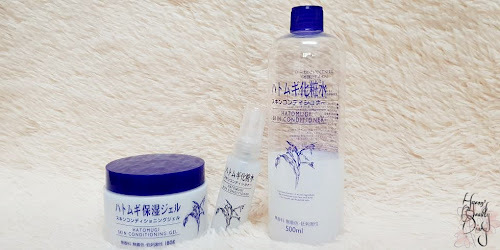 The essence is fast absorbed into the skin. My skin definitely feels moist, cool and not too sticky. It's really hard to tell whether the sheet mask is working for my skin or not at this point. One thing for sure, my skin is incorporating it nicely. It soothes the inner dryness and filled the quota for the day. What I enjoy the most? The comfort from Japan Silk (YASSS). It feels like your second skin. 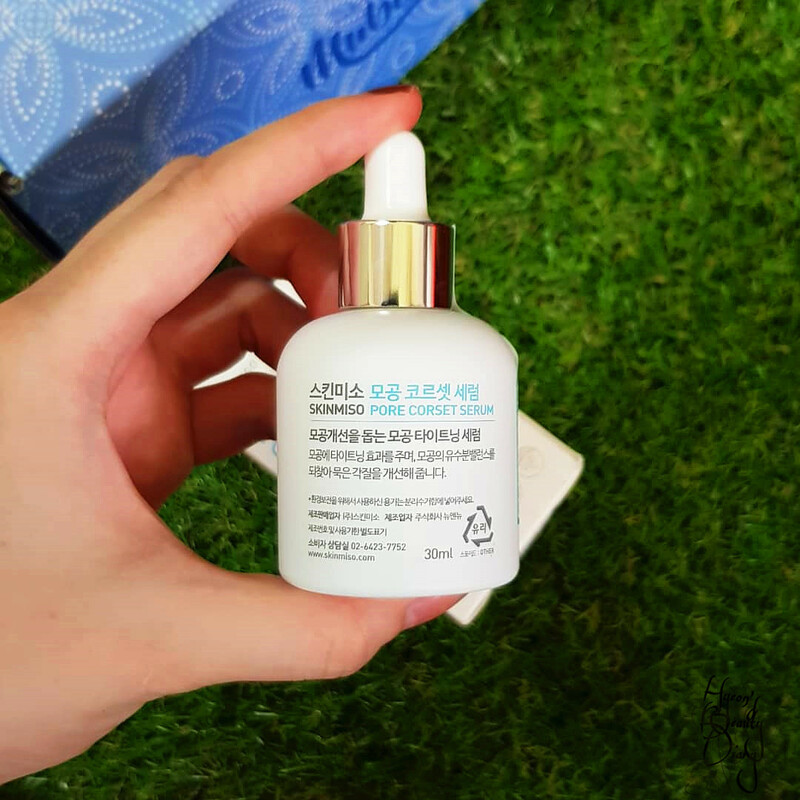 Recommend: Light-weight essence soothes inner dryness without feeling too much on the skin.